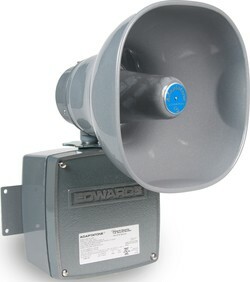 The Edwards 5532M Adaptatone Millennium Remote Speaker/Amplifier has been designed for high decibel system operation when connected to the 5540M Central Tone Generator. Each Speaker/Amplifier operates directly from local power sources, making it possible in a single system to connect the remote Speaker/Amplifiers to local power sources of different voltages. Designed for either 1/2" (13 mm) conduit or surface mounting. The 5532M-485Y6 is designed to be connected to RS485 networks, allowing full signaling communication control. The 5532MD-25AW and 5532MD-70AW are diode polarized units designed for use in applications requiring electrical supervision of signaling circuit field wiring. The 25AW utilizes a 25V RMS coupler board; the 70AW utilizes a 70V RMS coupler board. Adaptatone Signaling Systems are designed for industrial applications calling for high decibel output and microprocessor reliability combined with simultaneous signal delivery over all speakers included in the system. Typical applications include: emergency warning systems, plant evacuation alarms, security intrusion sirens, process monitoring, shift start-and-dismissal horns, and paging signals.